Leaving Caye Caulker, Staci (the angel who had found accommodations for us) asked us if we heard about the shark in front of our hotel. She then showed us a video of a nine foot hammerhead shark a hundred feet off the pier in front of our hotel. It was in a feeding frenzy!! The boat back from San Pedro to Corazol Town. People are packed in with cargo. There are two dogs, one is ours. The steps down aren’t fastened. An old fridge is loaded on by hand, and set in the aisle. I look up and see a wheel. It is attached to a motorcycle. The motorbike is passed down by four men. It is stood up by it’s kickstand. That’s it. No tie down straps. No clamps or ropes. The owner is sitting across from me. A little girl is laying against a post behind the bike. Finn’s head is on the floor, just below the footpost of the motorcycle. If the bike tips, it will crush my dog. 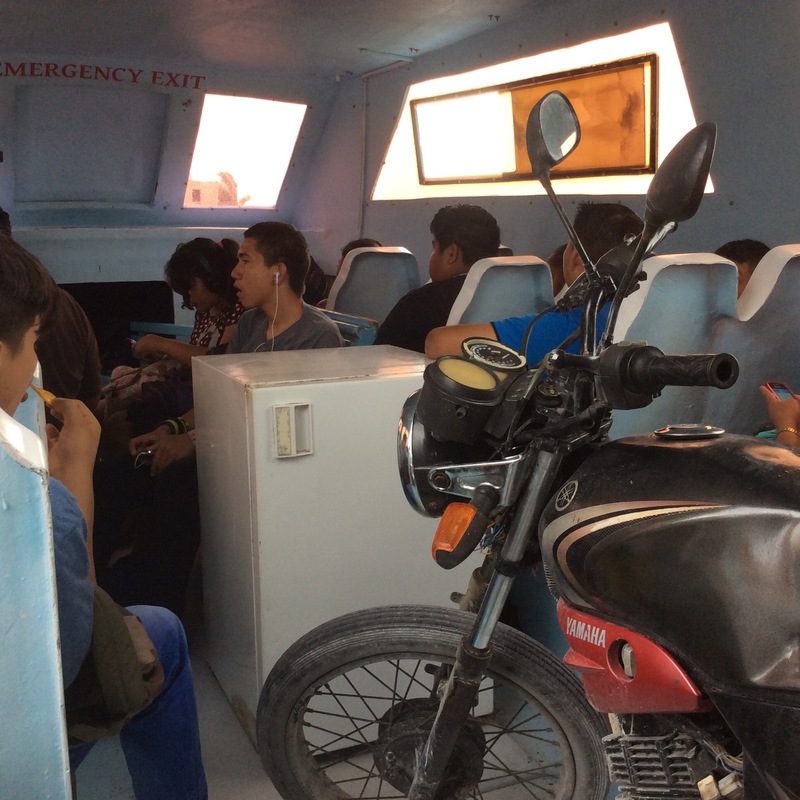 I hold onto the bike for the two hour ride as the boat sloshes and slam over waves and through water troughs. The sea is rough. The bike tips and slides, toward me, toward the little girl. We keep the bike upright. The fridge has slid down the aisle until it was maneuvered into a niche by the step. The ride is long and loud. Matt and Bea camp with us and take the boat back to their original destination the next morning. We just heard from them. The Thunderbolt broke down at sea with them aboard. It was fixed, but broke down again. Their short ride took several hours and they still had to pay for anew ticket! Love hearing about your adventures!! Wish we were tagging along with you!! I don’t think I could stand to be down below and not see the whereabouts of the boat. Must be the sailor in me! Glad the Poptart was safe for you. Enjoying the voyage so much. Next Next post: Tikal Me Pink!